Rumbling reported in the early morning of Wednesday, Oct. 23, is still baffling officials, who, a day later, haven’t found the cause. Residents called in to report a loud boom followed by shaking all the way from New Jersey’s southern tip to as far north as Hackettstown, according to a USGS map of the event. 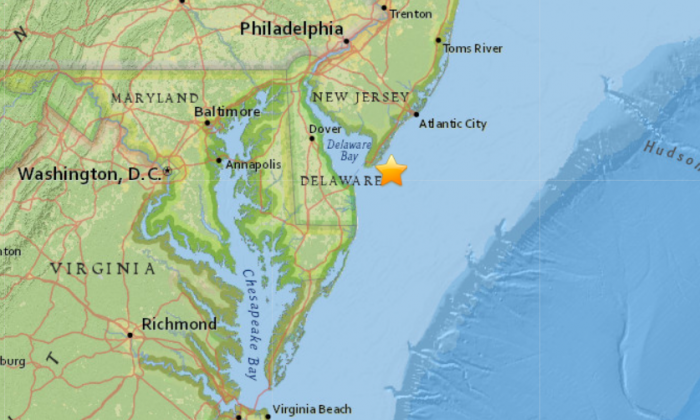 The USGS said that there were no earthquakes recorded in the area, but picked up a sonic boom at 10:18 a.m., about nine miles southeast of North Wildwood. “In the past it’s been military fighter jets doing drills,” the USGS said in a Twitter message. Calls to regional military bases turned up nothing. A spokespersons for Joint Base Mcguire-Dix-Lakehurst said they didn’t have any aircraft capable of breaking the sound barrier, and had no visiting aircraft that would be responsible for the phenomena either. At the Patuxent River Naval Air Station in Maryland, a spokesperson said they had no aircraft near southern New Jersey at the time. A spokesperson for the Naval Air Warfare Center Aircraft Division in Lakehurst, New Jersey, also said it wasn’t from any of their aircraft. The Federal Aviation Administration said they didn’t have any aircraft capable of breaking the sound barrier and had no information on military activities in the area. A spokesman for the New Jersey State police said he had heard about it, but didn’t know the source and said that the agency was not in charge of investigating it. There were no thunderstorms in the South Jersey region that morning that could explain it either. Anyone live in southern NJ? If so, did anyone feel or hear a loud boom! My house just shook after two large explosive sounds. Did anyone feel an earthquake in southern nJ just now? Something just shook my whole house! In January, a similar sound and shaking was attributed to an F-35C fighter jet, which has a top speed of nearly 1,200 mph, and an F-18 from Naval Air Station Patuxent River in Maryland. They were conducting supersonic testing off the coast, a Navy spokeswoman told The Associated Press. So far, no injuries have been reported as a result of the shaking.